Core Tax Annuals Full Set includes 6 Core Tax Annuals, fully updated to the latest Finance Act. Great value in-depth tax guides that cover all facets of UK taxation. 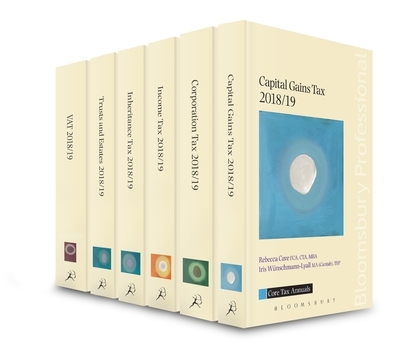 This set of Core Tax Annuals are written by Bloomsbury Professional’s leading UK tax authors. There is no compromise on content or quality, each book examines the latest legislation and tax developments in detail. User-friendly and accessible, they show how to apply the new 2018/19 tax opportunities to your clients’ financial affairs.